QASH Coin Guide: What Is QASH Cryptocurrency? QASH is a native cryptocurrency of the Quoine Liquid exchange and liquidity platform. It is made to become the token of choice for the financial services' industry, including institutions, fintech startups, and other finance companies. 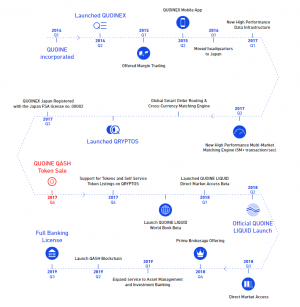 Quoine is a global crypto company which provides solutions to liquidity problems. More specifically, it aims to provide liquidity to the fragmented crypto economy. Big banks like Goldman Sachs, Citibank, or Barclays provide the most liquidity to traditional markets. QASH is meant to do the same, but for the crypto market. Illiquidity is a prevalent issue regarding crypto investments. You probably experienced it, too, if you’ve been in the crypto space for a while. Whenever you want to buy a promising altcoin project, there’s a multitude of three-way trades typically involving a fiat transaction, Bitcoin or Ethereum, and the coin you want. The same procedure applies when you’re going to cash out. Since most of the cryptocurrencies are used as investments, insufficient liquidity can impede the growth of the whole industry. 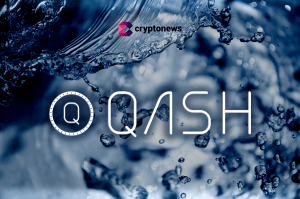 The Liquid QASH project tackles the issue by trying to connect as many cryptocurrency exchanges as possible to form one vast liquidity pool. Users from different exchanges will be able to trade in a single marketplace connected with QASH. For example, if Bitfinex and Bitstamp were connected to the Liquid platform, a BTC seller from Bitfinex could have his order matched with a buyer from Bitstamp. What’s more, Liquid’s World Book will have an integrated currency exchange service. The function would facilitate trades even when both users trade different currency pairs. 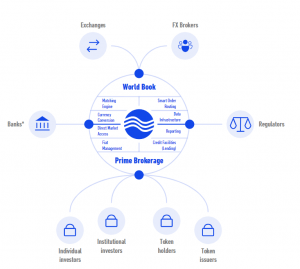 Eventually, the Liquid platform will be a global order book connecting many crypto exchanges to facilitate easy trades without favoring any single cryptocurrency. According to the QASH founders, contemporary cryptocurrency exchanges are like liquidity silos. Liquidity is available only for specific coins and only to the clients of particular exchanges. Besides, most exchanges offer liquidity just in a few highly liquid currencies (e.g., USD, EUR, KRW, CAD or JPY), while there is no highly-liquid on-ramp for holders of other fiat currencies. Collectively, these assets amount to a vast untapped pool of liquidity and QASH seeks to create convenient access to it. Despite rapid growth, the crypto market is still at its infancy. Without sufficient liquidity, most crypto startups remain at tremendous risk. Most projects keep their funds in dedicated tokens, and inability to liquidate them at the time of need could have devastating effects. Quoine is a Japan-based company behind the Liquid QASH project. It is the first cryptocurrency firm which was licensed by the Japan Financial Services Agency (FSA). Besides Japan, it has offices in Singapore and Vietnam. The company’s mission is to provide global access to the next generation of financial services. It employs at least 60 people, and the project's whitepaper mentions that collectively the team has more than 250 years of experience in Finance and Technology. Mike Kayamori and Mario Gomez Lozada co-founded QUIONE in 2014. Mike Kayamori is the CEO of the company. Previously, he was a Senior Vice President at SoftBank Group and Chief Investment Officer at Gungho Asia. He has over 22 years of experience in investments, business, IT and venture capital. Mario Gomez Lozada is the company’s President and CTO. Before QASH, he served as the CTO of Merill Lynch for 13 years. Also, he was the Chief Information Officer at Credit Suisse Japan. In other words, Liquid is destined to be the exchange for all crypto exchanges. Internal Order Book. An order book with FX-adjusted user orders. 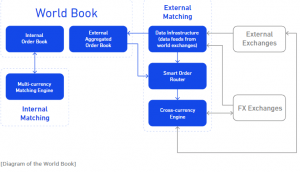 External Aggregated Order Book. An order book with the rest of FX-adjusted orders placed throughout other exchanges outside the Internal Order Book. The Internal Order Book and External Aggregate Order Book work in harmony to create fiat trading pairs which otherwise would not exist. Asides from that, the World Book uses three compartments to source and transfer liquidity. Matching Engine (ME). The Liquid platform needs to perform many cross-currency and cross-platform trades. To fulfill the project's mission, it needs to process an extraordinary number of transactions per second (TPS). For this purpose, the Quoine team has built an advanced matching engine capable of handling millions of TPS. It includes native support for the token pairings and can scale quickly as new pairings emerge. Cross Currency Conversion Engine (CCCE). It fuels automated and instantaneous currency conversions and allows even seemingly impossible trades. For instance, if you’re trading in BTC/EUR market, CCCE will enable you to deal with BTC/IDR market traders. As the engine improves, it should allow even more matches, thus creating a single consolidated and fluid market. Smart Order Routing (SOR). The SOR technology monitors all exchanges and fills orders that can’t be completed internally through the World Book. Direct Market Access. The platform users can efficiently manage their trading books, place orders, monitor risk and track global markets and exchanges from a single platform. Fiat Management. Quoine has built an extensive network of partner banks to ensure quick and reliable fiat transfers worldwide. Credit Facility. Users may leverage their current balances for enhanced trading opportunities. Also, Liquid’s credit facility will allow users to borrow using fiat or cryptocurrencies as collateral. Real-Time Reporting. Users can review their activity statements, positions, balances, transactions and other relevant information. Automated Trading Strategies. Users will be able to use third-party trading strategies with automated trading and market-making tools. They will function only to the extent permitted by law. Trading tools. 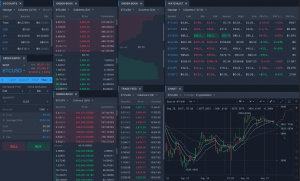 Users will have access to a novel trading dashboard with tools to monitor global markets, manage orders and positions, live charts, and other desirable features. Reduced custody and counterparty risks, since they are dealing with a legal and regulated institution in Japan. Better trade venues with limited speculation and liquidity problems. Sole exchanges are prone to speculation and pumps and dumps, while Liquid platform makes it more difficult to manipulate the markets. Regulatory Compliance. Being identifiable is a must for institutional investors and regular users who want or need to provide evidence for their income. 100% cold wallet crypto storage. 4-step withdrawal process (which can take a relatively long time). Multisignatures for BTC and BCH transfers. Low fees (the full fee structure can be found here). Fiat and crypto margin trading with up to 25x leverage. The Liquid platform prioritizes regulatory compliance, so every trader must complete KYC requirements before using the exchange. Since the launch of the platform, Liquid has opened an ICO Market as an additional feature of the exchange. It can be used both by the entrepreneurs to raise funds in a regulated and transparent manner, and investors, who want to put their money into transparent projects. Most importantly, the ICO Market allows ICO’s to raise funds in USD payments. The Liquid project roadmap includes implementing their own blockchain in the Q2, 2019. Such a move would allow Liquid to have a distributed ledger designed to tackle the unique problems of the finance industry. Along with that, financial institutions will have means to build DApps on top of the Liquid Distributed Ledger (LDL). It will include tools to implement KYC/AML, node management, credit/lending management, banking instruments, ability to issue new crypto tokens, matching engine, margin management, market data distribution and other features dedicated to financial institutions. If this idea becomes a reality, the QASH token will be used to power an entire ecosystem of financial services. Until the release of The Liquid Distributed Ledger (LDL), QASH will remain an ERC20 token issued on the Ethereum blockchain. Upon the release of LDL, the token will be rebranded as the Liquid token. Participating in the Liquid’s ICO market. QASH can be used for lending and margin trading. Incentivizing Liquid adoption through airdrops and reward programs. QASH tokens grant voting rights on the community issues. A perpetual 5% discount when QASH is used as a settlement currency on the Liquid platform. The Quoine’s team has minted 1,000,000,000 QASH tokens, of which 350,000,000 (35%) were sold to ICO investors. 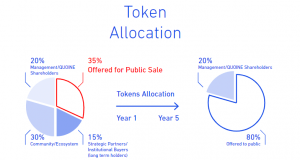 The remaining tokens are allocated to the community and ecosystem (30%), the team and shareholders (20%), and strategic partners and institutions (15%). Such model of distribution ensures that after five years the team will own only the 20% of total QASH supply. The QASH ICO lasted from November 5, 2017, to November 8, 2017. The team has met its goal to raise $106,400,000 (100%). One QASH was sold for approximately $0.24 or 0.0008 ETH at the time. All the crowdsale participants had to pass KYC/AML requirements. The raised funds were allocated as the graph indicates. Liquid (paired with USD, EUR, JPY, AUD, SGD, PHP, IDR, BTC, ETH, XRP, and 41 other pairs). Bitfinex, Ethfinex (paired with USD, BTC, ETH). CEX.IO, Huobi, Hotbit, Livecoin (paired with BTC, ETH). Gate.io (paired with BTC, ETH, USDT). GOPAX (paired with KRW, BTC, ETH). EXX, IDEX (paired with ETH). As an ERC20 token, QASH can be stored in any wallet with integrated ERC20 token support. MyEtherWallet is a popular free option you can use, as well as a browser extension Metamask. For more reliable security, you may also want to consider hardware wallets. These include all devices by Ledger and Trezor. Before using these wallets take note that Quoine plans to implement the Liquid blockchain, so be sure to follow the further announcements by the Quoine team and the wallet of your choice. The Quoine team has come a long way since its founding in 2014. Unlike most exchanges, it plays along with the law, which automatically means longer times to progress. Besides, the company receives regular audits by Deloitte, and 100% of the platform users are verified. After completing its successful crowdsale in Q4 2017, and launching the Liquid platform in Q4 2018, it surely lives up to its roadmap. Although the project looks decent enough, its success depends on the partners it lands. The rumor has it that the QUINE team already works with South Korea’s largest exchange (that would be Bithumb), and four out of five top U.S. exchanges. According to PR Newswire, the company has an official strategic partnership with Bitfinex. Developing the Liquid Distributed Ledger (LDL) to launch its blockchain in Q2, 2019. A mobile app to enhance the trading experience. A new roadmap should be released anytime soon. The release of the External World Book. New strategic partnership announcements with other exchanges for the release of the World Book. Acquisition of a banking license. Be sure to follow Cryptonews.com on Twitter and join our Telegram group for the latest updates on the Liquid QASH. Binance Coin (BNB) - The native digital token of the Binance cryptocurrency exchange. Bankera (BNK) - A digital bank and cryptocurrency exchange for the blockchain era. Ripple (XRP) - A digital asset designed to provide liquidity for real-time global payments. SALT (SALT) - A service to leverage your blockchain assets to secure fiat loans.